By using AWS and Amazon EC2 Spot Instances, Fugro Roames has enabled Ergon Energy to reduce the annual cost of vegetation management from AU$100 million to AU$60 million. Fugro Roames was founded as a business unit within Ergon Energy—a Queensland-based electricity distribution network operator and retailer—to provide asset management services that allow clients to remotely investigate the condition and performance of overhead powerline networks. Ergon Energy established Fugro Roames due to the unique challenge of managing Australia’s most geographically distributed network, with an AU$11.5 billion (US$8.8 billion) asset base distributed over 150,000km of overhead powerlines extending from north of Brisbane to islands near Papua New Guinea. The business case was to ensure clearance of vegetation away from the overhead lines to minimize the risk of service disruption, electrocution, and fires. Ergon Energy divested the Roames unit to the Netherlands-based Fugro in March 2014 to offer the same benefits to power companies worldwide. Fugro Roames now operates aircraft equipped with cameras and laser sensors to fly over customers’ networks and capture data used to build detailed 3D models of the lines and the environment in which they are located. The business then runs analytics and customer rules against the network assets and sends reports that teams use to prioritize and complete maintenance and preservation activities such as clearing vegetation. Fugro Roames started operations with servers, storage, networking, and associated systems running in an on-premises data center. However, as the business started building what Josh Passenger, Technical Architect at Fugro Roames, describes as a “super-computer friendly environment using fairly traditional supercomputing tools,” infrastructure restrictions such as periodic air-conditioning shutdowns and inadequate storage input-output operations per second soon became apparent. Fugro Roames experienced severe challenges in scaling its storage and backup systems to capture the rising influx of data, undertake processing, and retain the outcomes for analysis. Following a year in the on-premises data center, Fugro Roames began looking for alternative infrastructure options for its data capture, analysis, and reporting systems. A detailed review of cloud services led to a recommendation that the company use Amazon Web Services (AWS). “AWS would give us the flexibility to put different workloads with different operating systems into a single architecture,” says Passenger. Fugro Roames was also impressed by the maturity of the AWS APIs (application programming interfaces), the detailed documentation provided by AWS, and the ability to spin up prototypes in a short time to obtain some early wins—helpful for influencing conservative team members who had reservations about moving to a public cloud environment. Balancing normal business activities during the transition, Fugro Roames initiated a migration to the cloud in 2012. The business now runs all workloads in an AWS infrastructure in the Amazon Asia-Pacific (Sydney) region. To protect data from unauthorized access or disruption, raw data from numerous sources is loaded into a server and sent over a 10GB per second AWS Direct Connect link to an AWS architecture running in an Amazon Virtual Private Cloud (Amazon VPC). Both raw and interpreted data is stored in Amazon Simple Storage Service (Amazon S3), while resizable compute power is provided by a combination of on-demand and reserved Amazon Elastic Compute Cloud (Amazon EC2) instances running in Windows or Linux operating systems. Adept use of Amazon EC2 Spot Instances— unused EC2 capacity available in the AWS cloud offered at up-to 90% off of On-Demand prices— has helped Fugro Roames reduce the cost of what Passenger describes as its “heavy lifting computing” to one-eighth of the cost of using on-demand Amazon EC2 instances. A database running in Amazon DynamoDB supports concurrent access from a cluster of Amazon EC2 Spot Instances, while the interpreted data is sent to Amazon Glacier for archiving. Messages are distributed between various components of the AWS architecture using Amazon Simple Queue Service (Amazon SQS). 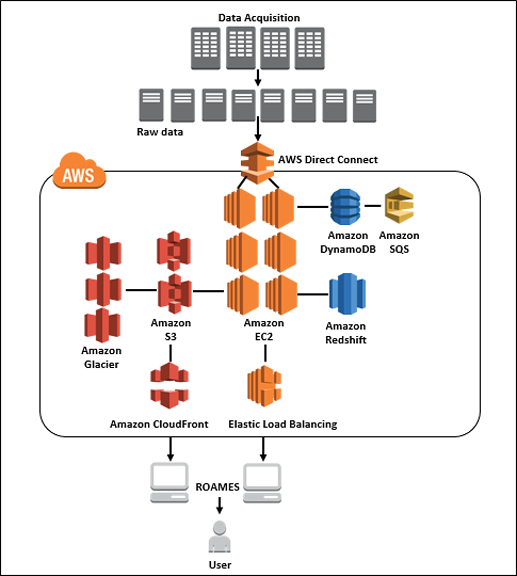 An Amazon Redshift data warehouse batches and models information for clients. Amazon CloudFront is used as the content delivery network between the VPC and end users, while Elastic Load Balancing is used to balance traffic. Fugro Roames team members are also extremely keen to build their skills in AWS and have taken architecture courses, as well as online training courses and associated resources. “We receive visits once a month from an AWS technical architect who briefs us on future developments, and answers any queries we have,” Passenger says. By using AWS services and tools, Fugro Roames can capture large volumes of granular data, such as the details of 100 million trees close to the Ergon Energy network, and can generate timely, accurate reports for the field teams charged with preserving the lines. “By using AWS and the Amazon EC2 Spot Instances, Fugro Roames has enabled Ergon Energy to reduce the annual cost of vegetation management from AU$100 million to AU$60 million.” says Passenger. Internally at Fugro Roames, technology capital costs have fallen by 95 percent, and the business no longer requires a team of five full-time employees dedicated to infrastructure management. AWS is also delivering infrastructure availability levels exceeding 99.999 percent. Fugro Roames’ responsiveness to customer needs have improved considerably. In February 2015, Fugro Roames aircraft were mobilized to fly to northern Queensland following the destruction wrought by Cyclone Marcia—an event ranked in the same category as Hurricane Katrina in the United States. Historic data is also easily accessible. “We can present our customers with data going back three years in a matter of minutes,” says Passenger. The business has now successfully expanded into the United Kingdom and is reviewing opportunities in other markets after establishing a presence on AWS in Ireland. Learn more about big data and analytics on AWS, and how to use Amazon EC2 Spot Instances to reduce IT costs.